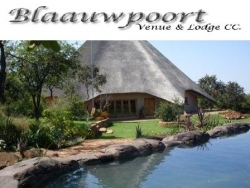 Blaauwpoort Wedding Venue & Lodge is situated on a privately owned Game Farm that is set in the lush greenery and unspoiled natural beauty of the bushveld overlooking the majestic Magaliesberg. In a safe and private environment, 45km from Pretoria and 100km from Johannesburg, Blaauwpoort is the ideal breakaway and has the perfect setting for a wedding, conference, birthday, corporate function or anniversary. The unique thatch roof wedding venue consists of a main hall, a small private hall and an oversized balcony overlooking a magnificent valley. The wedding venue boasts an ambience of tranquillity in its country surroundings and will accommodate for a variety of tastes. A Beautiful outdoor wedding chapel next to 8-meter high age old Allows is part of this unique setting and our indoor chapel compliments the bushveld surroundings. At Blaauwpoort Venue & Lodge your wedding day is the day you will remember for the rest of your life.The wedding venue has its way of etching itself into your memory. There is something undoubtedly magical about the Blaauwpoort Venue & Lodge on your wedding day. Blaauwpoort Venue & Lodge has one of the best outdoor wedding venues. Planning your wedding ceremony takes a lot of effort and forethought. The Blaauwpoort Venue & Lodge outdoor wedding venue will give you the finest that this beautiful country has to offer.